Prior to making an investment in a start-up, investors look to ensure that the team, product, and market aspects are all strong. They then carry out due diligence to expose and plan for potential risks. These usually include financial and legal risks, but more and more investors are focusing on intellectual property too. 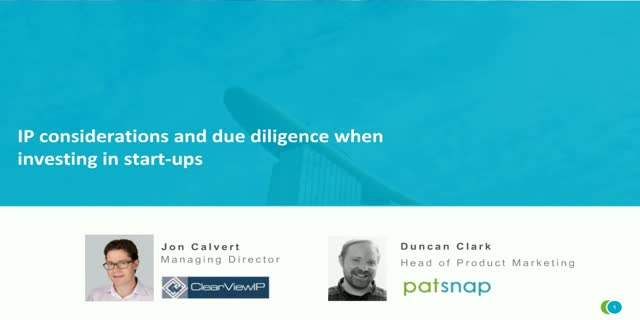 PatSnap will be teaming up with Jon Calvert, Managing Director at ClearView IP, to discuss what aspects should be considered when beginning due diligence and how a rigorous approach can secure a greater likelihood of realising substantial investment returns. - What kind of intellectual property does a startup actually have? - How do I know if the intellectual property position is strong? - What kind of things should be on my intellectual property due diligence check list? - How can I put a financial value on the intellectual property?